Overall market sentiments are bullish since beginning of this year with continuation of positive news flows like uptrend of global recovery, decline in inflation, progression of good monsoon in the country and interest rate cut by RBI. With continuous buying by domestic Institution investors backed by strong retail inflows, Nifty moved above the psychological mark of 10,000 once again during this month and hovering around these levels. Currently, the PE ratio of Nifty 50 stocks is around 25.5 and is trading well above its historic average. However, with expectation of increase in earning growth in coming quarters which mainly got delayed due to demonetisation and later due to GST implementation, Nifty is expected to trade at similar valuations going forward. Since inception, our Wealth-Builder portfolio has outperformed Nifty and Sensex by wide margin. Since 1st Jan 2013, Nifty has given returns of 68.3%, Sensex returns is 63% where as our Wealth-Builder portfolio has given returns of 342% to our members. 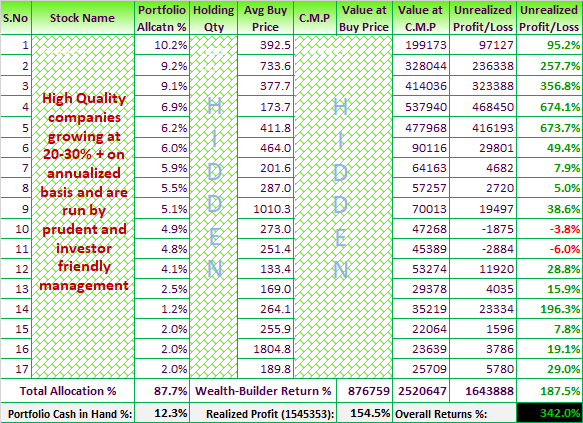 In terms of performance, 6 top performer stocks out of 17 of Wealth-Builder portfolio have given returns in the range of 95% to 675% since 1st Jan'13 that too when many of these stocks out of 17 were added in portfolio during last couple of years. Moreover, 10 stocks out of 17 have made 52 week high / all time high recently. We continue to hold these stocks as we believe these companies are registering good growth every quarter and doing all the right things to continue delivering robust top line and bottom line with strong operating margins. Note: Wealth-Builder portfolio update - Oct 2017 will be released today on 11th Oct'17 (by end of the day) and we will share the same with our Wealth-Builder members. Start managing your equity portfolio like a professional, subscribe to Wealth-Builder by paying nominal annual fee of Rs.20,000 18,000 for entire year availing 10% discount under ongoing Dussehra Diwali offer of the year. Click here to subscribe to Wealth-Builder online. Subscribe now and we will ensure that you receive our Wealth-Builder portfolio - Oct'17 update once it is released by end of the day today.